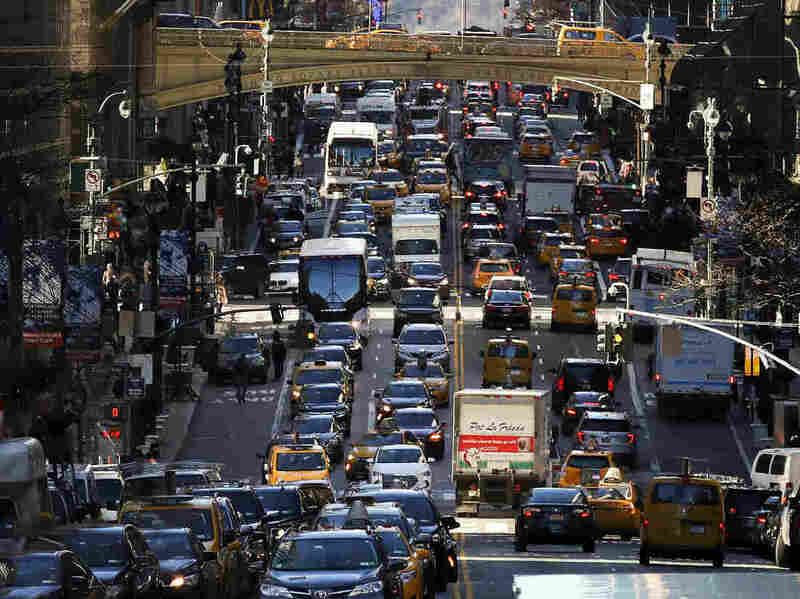 New York Is Set To Be First U.S. City To Impose Congestion Pricing Motorists will pay a flat daily fee to enter Manhattan south of 60th Street. The new program aims to reduce traffic gridlock while generating revenue for the city's stressed transit system. The plan? To reduce gridlock while generating revenue for the city's stressed transit system. State lawmakers approved the deal on Sunday night, and the new tolls are slated to go into effect in 2021. The tolling is expected to generate $15 billion, dedicated to funding the MTA, New York's transit authority. The plan will be what's known as "cordon pricing," in which motorists pay to enter a zone. In this case, that zone will be Manhattan south of 60th Street. New York's experience "will be an important precedent for the conversations happening in other U.S. cities," Corinne Kisner, executive director of the National Association of City Transportation Officials, told The Wall Street Journal. The city's plan, unsurprisingly, has elicited a backlash from some corners — such as New Jersey. "[W]hy should NJ not implement a commuter tax on NYC residents leaving NYC that exempts NJ residents so WE can fund our transit. Reality is any commuter tax should be a regional convo not just NY," tweeted Jersey City Mayor Steven Fulop. Sam Schwartz, a traffic engineer and former New York City traffic commissioner known as "Gridlock Sam," told NPR last week that the toll for cars will likely be $10 to $15. Any exemptions could be exploited, as at least one observer noted. And for each exemption that's carved out, less revenue will generated and the impact on congestion will be smaller. New York's move comes more than 15 years after London implemented fees on vehicles entering its central business district. The fees made an immediate and significant dent in congestion. "Within a year of the fees being charged in 2003, the number of vehicles entering an eight-square-mile area of London dropped by 18 percent, according to city officials. Traffic delays went down 30 percent. The average speed of vehicles in the zone rose to 10 miles per hour from 8.8 m.p.h.," The New York Times noted. There was an environmental effect too, "with a 12 percent reduction in emissions of nitrogen oxides and particulate matter from vehicles in the zone." Stockholm and Singapore have also implemented congestion fees. But London's gains are being threatened by a rise in private hire vehicles — such as those driven for Uber — which are exempt from paying the congestion fee. The number of such vehicles licensed in London jumped from about 50,000 in 2013 to nearly 88,000 last year. Schwarz, the traffic engineer, notes that New York has been talking about congestion pricing for decades. "We're in it for the long haul," he said last week. "The city will probably get sued, the state will get sued, but I think this time we will get it through."